Sorry I did not sent my last report from South America trip. From Patagonia I took 36 hours bus ride to Buenos Ires. From Puerto Mott, Ch. to Bariloche, Ar. I rode right under volcano Puyehue, which is erupting now. It is familiar pattern. Two days after I left Thailand, it was tsunami of year 2004. Soon after I left Northern Pakistan in 2005 it was earthquake there. May be I should stay home and do not travel at all. My South American trip was 7.500 km long. It took 72 days. I spent 240 hours on buses. It was finished in Buenos Ires where I ate parilla (barbecue) and watched tango. It was not much to write about, so I did not sent TN. I started my summer trip from Germany. I rode bike along Mosel and Rhine rivers. It was short, but quite interesting trip. I started from Trier. 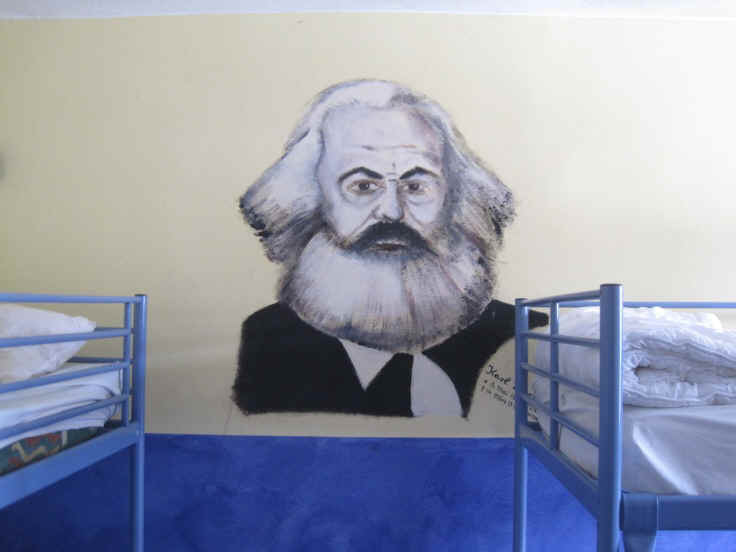 I spent 2 nights in Hille's hostel in Trier in the company of two nice German girls and...Karl Marx. See picture. Karl Marx, who was born in Trier, is one of major selling points of Trier. His pictures are on the tour buses, on walls, in travel agencies. It is such an insult to the leader of world proletariat, that his name is used by local bourgeoisie to extract surplus value (profit) from the tourists. 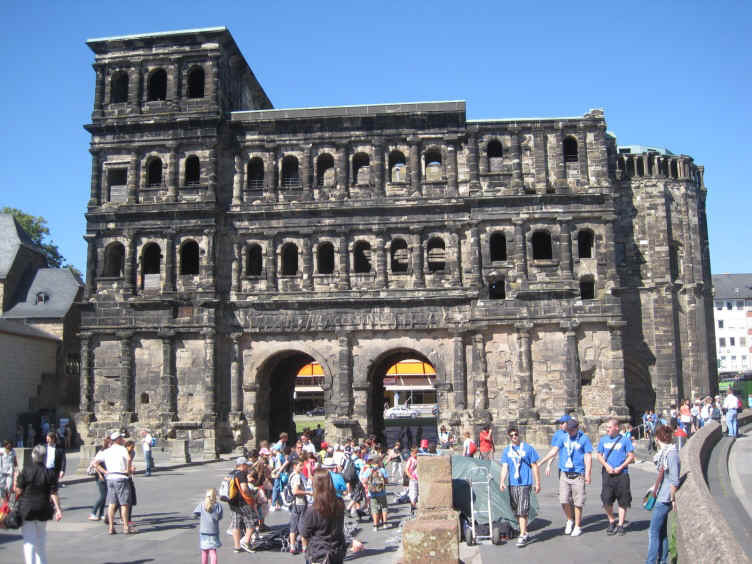 Another major attraction of Trier is Porta Negra (city gate) in attachment. It was built by Roman Emperor Constantine and it is standing from that time. Two relatively small gates in the middle are too small for now-day traffic, so traffic goes through the street around the gates. Bike ride along Mosel river was pleasant. I made reservation in hostel in Traben Trarbach. I was pooped well before I reached it. But I have to ride to Traben as all hotels/hostels along the road were full. Boats with tourists drinking Riesling wine overtook me. I found a satisfaction in that consideration that while drinking wine is more pleasant, pushing pedals is more healthy. Next morning I decided not to continue on Mosel, but switch to Rhine. 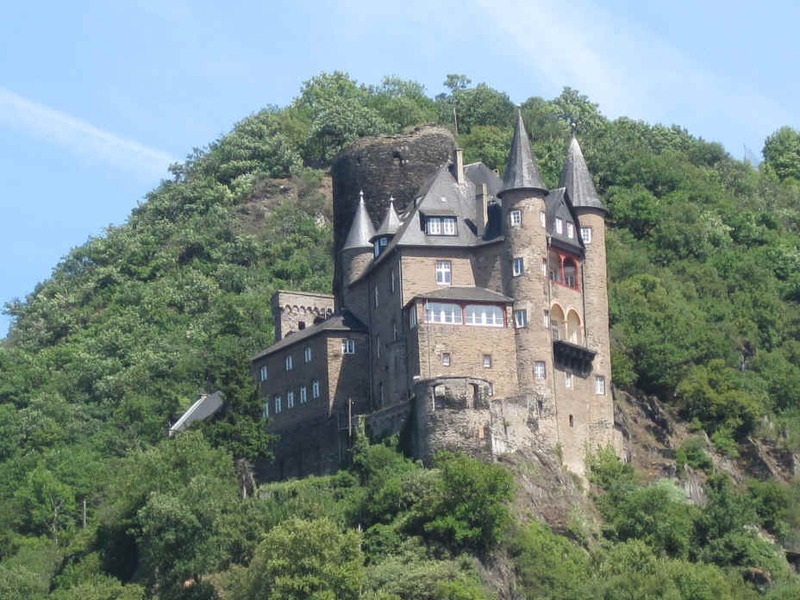 I took a train to Koblenz, then another train to Bingen on Rhine river. On the train to Koblenz I witnessed weird scene. Middle age stocky woman suddenly jumped from her seat and rushed toward the driver cabin. On the way she stumble on a bicycle standing in the tambour, she fell and slid into driver cabin and hit the wall. At next station she was taken by emergency. What she wanted to tell the driver is still unknown as she was unconscious. From Bingen I started to ride bicycle toward Koblenz. High above the river the magnificent castles were standing. 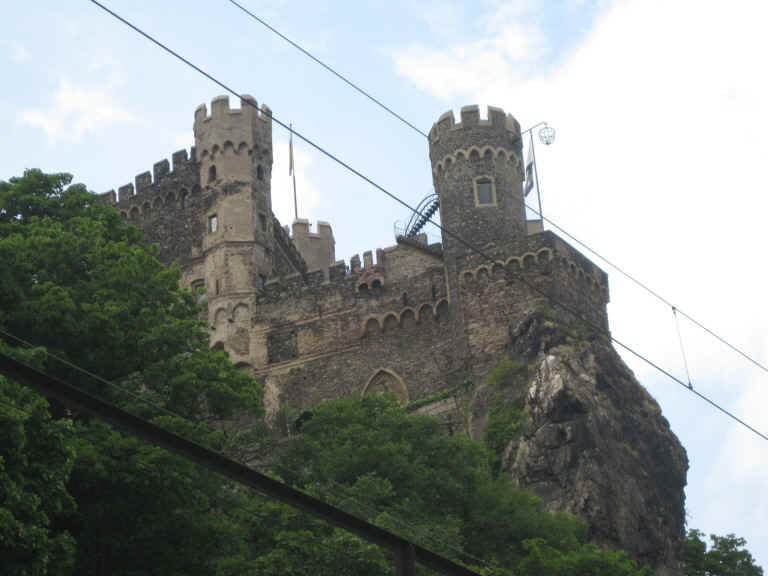 First was Burg Reichenstein in attachment. I started to ride bike in late afternoon. So, soon I started to look for hotel as the evening approached. It was Saturday and everything was booked, in spite of quite high weekend prices. As night approached I found excellent place for camping about 700 meters North from Bacharach, below the huge sign "Bacharacher Hahn". It was at the exit of water tunnel under the road. Small creek was running through the tunnel. On the shore of this creek I erected my tent. While it was closed to the road it was not visible from the road, protected by concrete slab, see picture. Few meters below was Rhine. Ideal place. After I erected tent I went to Bacharach for dinner. 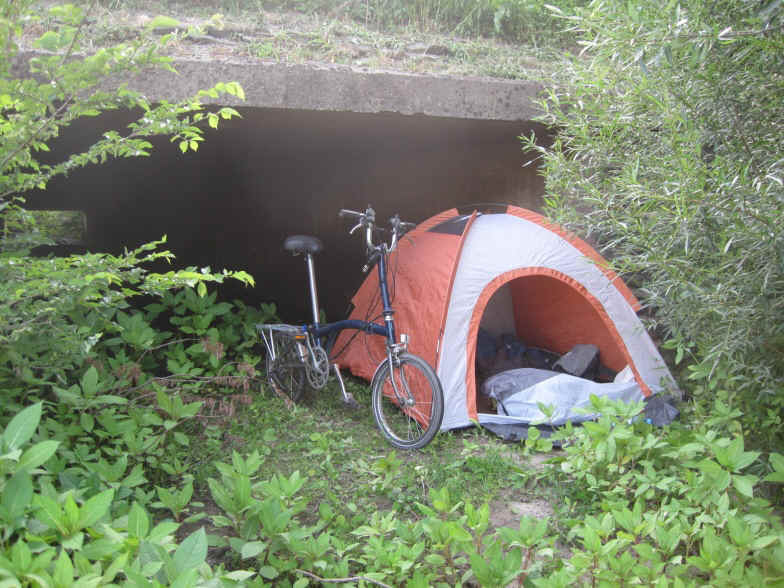 It was no problem to leave my tent and all my stuff because place was very well hidden. Next day I rode near famous Loreley, see picture. 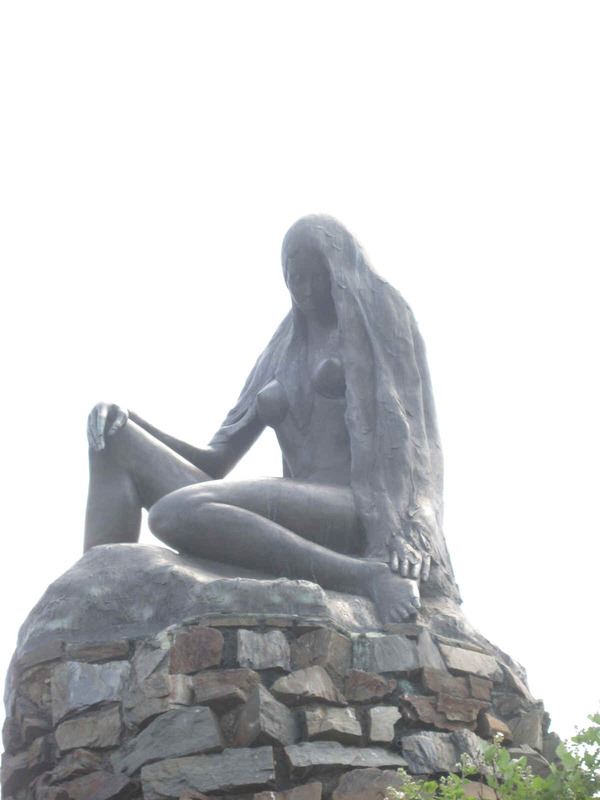 This girl is known for misguiding sailors, which resulted in their death in the waters of the Rhine. I think this accusation is false. Rhine is not very big river and a person with good swimming skill can swim across it. Nearby famous Burg Katzenelenbogen is standing, see pic. Traveling in Germany may be not so easy as you may expect. Train, subway, parking and other ticket are sold by machines in most places. I usually asked somebody to help me or ride without ticket. Light in toilets automatically switches off in about 2 minutes. And you have to jump in the middle of room and start wagging you hands to activate motion sensor. When you enter multifloor apartment building, you have no way to find person you are visiting. Names of people are listed outside, but there are no apartment numbers. If you do not have mobile phone, when you are lost. For breakfast in hotels/hostels you cannot seat just at any table. You have to find table with your name on it, not easy task if there are several tens of tables. JDH model hostel set an example of German rationality. They do not have forks, only spoons, and knifes, because people make sandwiches and they presumably do not need forks. By the way it is not only in Germany. In France it was the same. This is why I like third world countries. PS: June 23 at 7 pm I will make a presentation on my South American trip of 2011 in school # 30, across from Vasileostrovskaya Metro Station. Everybody is welcome.